Get a powerful revenue-generating fantasy sports application in a short span of time. In the market many multiple company support everything from pre-launch marketing to developing a custom fantasy application.For sports fans, every league of their favorite sports is important. Fantasy company focus is on developing daily fantasy league sports software. It means in the market having a lot of opportunity to create more user engagements and find newer sources to generate revenue in fantasy sports. We all know that a large number of population of the world using Android and iphone mobile phones. Fantasy sports software allows you to reach maximum number of game lovers easily,Fantasy apps operating on android and iPhone is fulfilled by us. Expert programmers create android & iPhone fantasy games to capture those game lovers who are using phone. We are a leader in providing white labeling of fantasy web and app solutions. 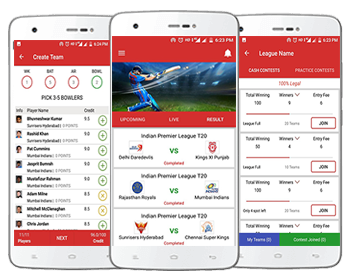 Our team of experts creates a powerful and well-functional fantasy cricket apps for Android smartphone users. We create fantasy apps that run smoothly on iPhone. We know that a number of users are now using iPhone. So, the demand for fantasy apps supporting iPhone is on the rise. It is fulfilled here. If you want to create a secure and robust fantasy gaming website, we are all here to support you. Create a website that is user friendly, fast and secure. Our fantasy apps and websites are a mirror image of your creative imagination. The design is unique and attractive to engage users. We understand how important it is for you to build trust with your clients. Our secure app development services help to create 100% secure fantasy apps. We have years of experience in the field, so our experts are very much aware of the rules and regulations of the game. Each application we create keeping the rules in mind. Get your fantasy app at affordable prices. Robust, flexible, easy to maintain and secure fantasy applications are developed by us. Are you looking to invest in the matrimonial business?